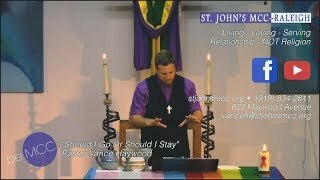 Tuesday Night Bible Study: God’s Still Communicating? Is the Bible the only means for God speaking to people? Is prayer a one-way conversation, or does God communicate as well? Does God speak through our circumstances? Is not God capable of applying God’s word to our lives in numerous ways? Maybe you have been confused about what God is saying to you or taught that God does not speak. Maybe you are disillusioned by those who claim to hear from God and use it irresponsibly. We will discuss what Scripture has to say about it and open our eyes and ears to ways God intimately relates to us personally. Cindy Norton leads a study called “God’s Still Communicating?” beginning Tuesday night, June 19th and for each of 8 weeks - taking a holiday break on July 3rd. We meet in the William Stokes Friendship Hall on Tuesday nights starting at 6:30 pm. Come early and bring your bag dinner to eat with others who gather early. As we continue our journey through lent and now enter into Holy Week, we pause to reflect on the sacrifice made and the Love that was shown through the events of this week. We acknowledge that through the unconditional and reckless love that Jesus freely gave, that we are called to Love in the same way; freely and unconditionally. We are reminded that through the pain and suffering of darkness of this week, there’s a bright and glorious light that awaits us! The light of Jesus Christ! Holy Tuesday Discussion Group - Our conversation focuses on Jesus' reaction to the abuse of the Temple. Spy Wednesday as we focus on Judas and consider the topic of Betrayal in a way that you may have never thought of! Maundy Thursday as we focus on “The Last Supper.” Joining in communion with one another - a new take and mind changing experience on a tradition with powerful meaning; though it may not be what you think! Good Friday as we visit Jesus in those finals hours and focus on the sacrifice made. We will focus on stations of the cross and how they are applicable to us today as we reflect, meditate, and renew our call to action. Holy Saturday Vigil when the church will be open for you to come by and sit for a moment or a while in prayer and meditation. We encourage you to come and spend time at the foot of the cross as you reflect on your own spiritual journey and also to pray for justice. When we come together in prayer, it changes things, it moves us to action! Let this journey prepare you for your future, for your ministry! Tuesday Night Bible Study returns on February 6, 2018, and for each of 8 weeks through the end of March. The first session on February 6th is absolutely required if you plan to be a part of this study. Otherwise, the remaining classes probably won’t make sense. Join us as we install the fifth pastor of St. John's MCC and celebrate our 42nd birthday. The Rev. Terri Steed Pierce, Pastor of Joy MCC in Orlando, Florida, is our Anniversary Guest Preacher, and many former Pastors of St. John's MCC along with other special guests will be here to help us celebrate on Saturday. More details coming...!